Hindu School, the junior section of the Hindu College, is reputed to be the oldest and leading institution in India to impart modern education to the young students in European and Oriental subjects. The School, designated Pathsala, was established in 1817 along with the Hindu College, designated Mahapathsala, by stalwart educationalists like David Hare, Diwan Baidya Nath Mukherjee, Maharaja Radhakanta Deb, and others in a ahead-of-era intent. It all started in the year 1815 when Raja Rammohun Roy entertained a few friends at his house and suggested the establishment of Atmiya Sabha for improving the moral conditions of our countrymen. The Raja was animated with a fervent desire to lift the society from the swamp of idolatry and superstitions to a higher moral plane. David Hare differed from his views and suggested establishment of a College. It was Hare’s considered opinion that education of native youths in Western literature and science would be a far more effective means of enlightening them with rational understanding of truth. The proposal was enthusiastically accepted by Rammohun. That was how the idea of Hindu School and College sprouted. The General Meeting was held on the 21st May 1816, in a house on the Old Post Office Street that was lately occupied by Chief Justice Colvile, and tenanted afterwards by Messrs. Allen Judge and Banerjee, and a conclave of other lawyers. Among those who did not attend the meeting was Raja Rammohun Roy. Though he had heartily entered into the plans of David Hare, and zealously aided in their development, Rammohun willingly allowed himself to be laid aside lest his active co-operation should mar the accomplishment of the project, saying— “If my connection with the proposed college, should injure its interests, I would resign all connection.” The meeting resolved that an institution for promoting education be established. The institution shall include a Patshala, or a School, and an Academy, Maha Patshala, The former to be established immediately, the latter as soon as may be practicable. The primary object of this Institution is the tuition of the sons of respectable Hindus in English and Indian language, and in the literature and science of Europe and Asia. The English language shall not be taught to boys less than eight years of age, without Manager’s permission. The school shall teach English and Bengali, Reading, Writing, Grammar and Arithmetic by the improved method of instruction. On January 20th , 1817 , The first batch consisting of 20 male students hailing from affluent Bengali Hindu families of Calcutta, met at the rented house of Gorachand Basak at 304 Chitpur Road in Garanhata marking the beginning of Hindu School. 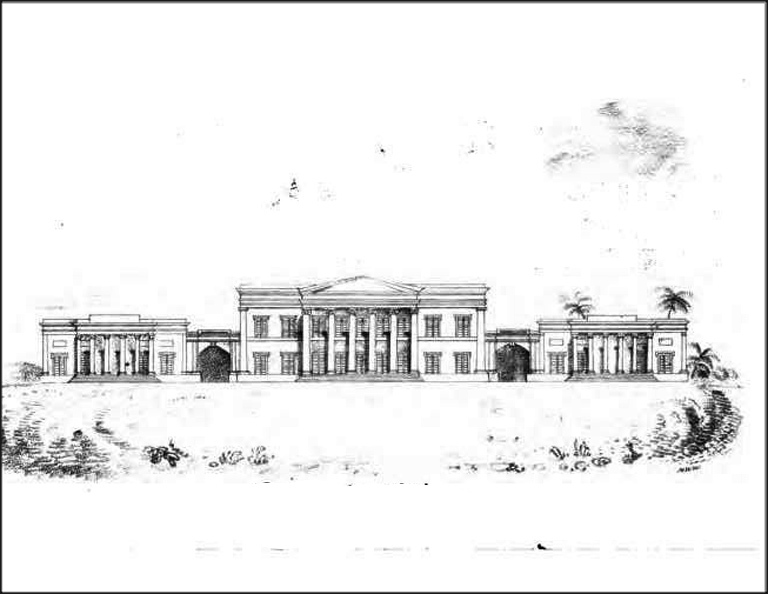 In 1825, with the help of the British Government, a school building was built for 1 lakh 24 thousand rupees, towards the north of Goldighi, now College Square, on a land donated by David Hare. Dewan Baidya Nath Mukherjee was deputed to collect the subscriptions for the new school. Sir Edward Hyde East, Chief Justice of the Calcutta Supreme Court was invited to chair the committee and Joseph Baretto became the Treasurer. The principal donors being the Maharajah of Burdwan Tejchand Bahadur and Gopee Mohun Thakur, each contributing Rupees 10,000. On the opening day there were 20 pupils on the rolls but within the next three months the number swelled to 69. On 15th June 1854, the upper section of the school, the Hindu Mahapathshala or the Hindu College, was made an open center for modern education including eastern and western philosophy and science and was separated as Presidency College. The junior section, Pathsala, gained independent existence as Hindu School – a national heritage of institutional education, and educational reform. Here, in this Hindu College, by De’rozio and other teachers, a group of young men of Bengal was baptised with the teachings of modern science and social philosophy. It produced Dakhinaranjan Mookherjee, Ram Gopal Ghose, Tarachand Chakravarty, Krishnamohan Banerjee and others, the brilliant flowers of Young Bengal, the makers of Modern Bengal. The tree of education had already taken root and the blossoms everyone could see around. By these students of Hindu College, a powerful and gigantic social movement was unleashed in Bengal the repercussions of which were felt all over India. This entry was posted in English Education, Vernacular Education and tagged atmiya sabha, calcutta, chief justice colvile, chitpur, college square, dakhinaranjan mookherjee, David Hare, de'rozio, diwan baidya nath mukherjee, Educational Institution, edward hyde east, garanhata, goldighi, gopee mohun thakur, gorachand, hindu, hindu college, joseph baretto, krishnamohan banerjee, maha patshala, maharaja radhakanta deb, maharajah of burdwan, old calcutta, pathsala, ram gopal ghose, rammohun, tarachand chakravarty, tejchand bahadur, young bengal.